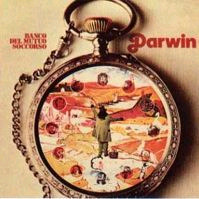 If I was to make a list of ten essential masterpieces from the prolific golden age of Italian progressive rock, Banco Del Mutuo Soccorso's Darwin would be at or near the very top of the list. That statement does not come lightly. It took me years to warm up to the album and even now, the dazzling complexity of the arrangements is still enough to make my head spin. Though an embryonic version of Banco had formed as far back as 1968, the band didn't get around to releasing a full length LP until their self-titled debut in 1972. All the elements of the classic Banco sound were already in place: the dueling keyboard chops of Vittorio and Gianni Nocenzi, the understated but effective psychedelic guitar leads from Marcello Todaro and the spot on rhythm section of bassist Renato D'Angelo and drummer Pier Luigi Calderoni. But it was their vocalist that truly distinguished the group from so many other Italian rock bands of the time. Francesco di Giacomo possessed a voice that was equal parts Freddie Mercury, Luciano Pavarotti and even Jon Anderson. Like those three singers, one either loved his voice or loathed it, and Di Giacomo's operatic tenor was the icing on the cake (or the fly in the ointment, depending on one's viewpoint) to a masterly musical recipe. At any rate, Banco's debut was a stunning commercial and critical success and attracted just as much attention for its elaborate packaging as the music contained within. However, Banco's best was still to come and progressive rock aficionados still argue whether Darwin or Io Sono Nato Libero was Banco's very best. It is indeed a close call, but I give the nod to Darwin. Banco were somehow able to use the same ingredients that worked so well on their first album and make an even more impressive follow up just six months after the debut. Banco did this in three ways: they beefed up the already impressive arrangements, they added synthesizers to the layers of keyboards and they made significant improvements on the relatively flat production of the debut. Additionally, Banco put all these ideas together for their first concept album about man's evolution according to the titular 19th century scientist. The album begins with the fourteen minute "L'Evoluzione" and if it isn't one of the most challenging compositions among the many greats in all of progressive rock, then I don't know what is. It begins tentatively as the Nocenzi brothers color the air with gothic shades of haunting organ and piano, before the rest of the band gradually enter. It builds up to one incredibly exciting climax before a false ending. Indeed, "L'Evoluzione" is so full of musical surprises that one could spend an entire review focused on its numerous changes in time, key and mood but I will leave that to the musicologists. Suffice to say, if Gentle Giant ever did an extended piece, it might sound a little like "L'Evoluzione". Side one of the original vinyl concluded with "La Conquista Della Posizione Eretta" and where "L'Evoluzione" is all about style and arrangement, "La Conquista.." is just wall to wall intensity. Vittorio Nocenzi gives the Moog synthesizer a real workout while the rest of the band complement him with a bouncy rhythm full of counterpoint. The entire band comes together for the James Bond inspired main theme. The pattern is more or less repeated before Francesco Di Giacomo finally resolves the tension with his uniquely emotional voice as the song gradually fades. "Danza Dei Grandi Rettili" is a pleasant and short instrumental cocktail jazz piece. It serves as a breather between two draining compositions and while some have criticized it as filler, the break is most definitely welcome. Banco come reeling back with "Cento Mani e Cento Occhi". It is similar in scope to "La Conquista.." in that it wows the listener with astounding keyboard flourishes and heavy dramatic vocals. It is almost as if the band took Emerson Lake and Palmer's "Tarkus" and condensed it into five minutes. Francesco Di Giacomo contributes one of his greatest performances with "750,000 Anni Fa�L'amore? ", a beautiful aria that is to this day a live favorite. One need not speak a word of Italian to feel the goose bumps raised by Di Giacomo's pleading tone. It is without question one of the best ballads of the entire progressive rock idiom. As well, Gianni Nocenzi's sympathetic grand piano provides the perfect backdrop for what is the most straightforward and moving composition of the album. "Miserere Alla Storia" is a really twisted piece of music which features vocals from Vittorio Nocenzi. Nocenzi also plays an extensive amount of clarinet on "Miserere..", certainly an unusual additive for a rock band. Nocenzi's vocal lament in the middle portion of the song is book ended by a jumpy keyboard theme that manages to sound simultaneously classical and gothic. Eerie and playful, it is probably the most underrated track of the entire album. Finally, Darwin concludes with "Ed Ora Io Domando Tempo al Tempo ed Egli Mi Risponde�Non Ne Ho!!" As with the debut album and Io Sono Nato Libero, Darwin ends on an uplifting note with a short anthem heavily influenced by Italian folk music. I love this device and it always reminds me of the extended wedding sequence in "The Godfather" for some reason. As haunting and evocative as Darwin is, "Ed Ora.." brings the proceedings right back to earth. It is the perfect ending to a perfect album. Banco would go on to release many more excellent albums but their high water mark will always be, for me at least, Darwin. I never grow tired of hearing it. Each spin reveals something new, perhaps a previously unnoticed sonic texture or even a different emotional response from the last time I played it. Fortunately, the album has been well served on CD. However, avoid the original BMG issue and try to find the budget priced 24 bit gold digi-pack remaster. What the remaster lacks in packaging, it more than makes up for in sound quality. The bass tones emanating from Vittorio Nocenzi's Moog are remarkable and best experienced either with the digi-pack remaster or the pricier Japanese mini-lp CD version. I've bought Darwin three times over the past fifteen years; four times if one counts the inferior (but still decent) 1992 remake. The only other album I've purchased so many times over the years is Dark Side of the Moon. That should be a sufficient indicator of how much I adore Banco's Darwin.